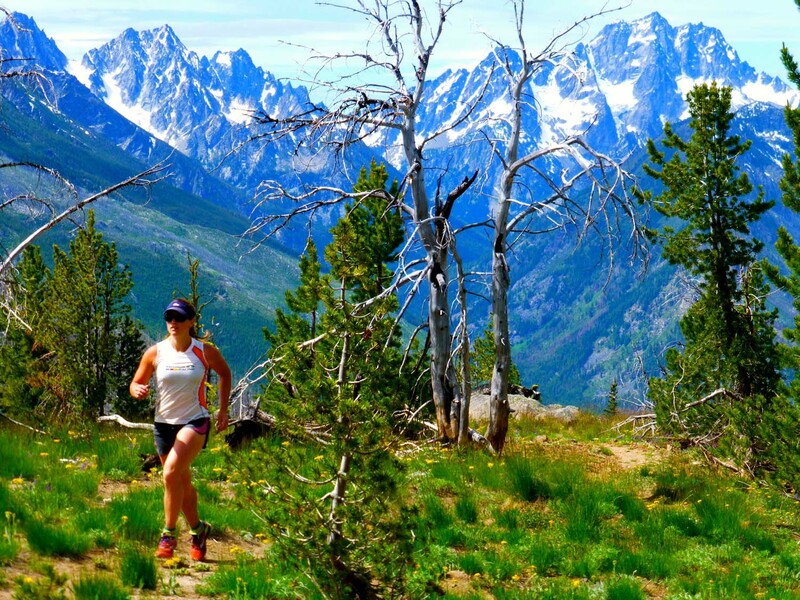 If you’re looking for a tough run that has ‘take your breath away’ views, stacked with a probable mountain high — look no further. As the longest, most scenic ridge run in Washington, Icicle Ridge has it all! 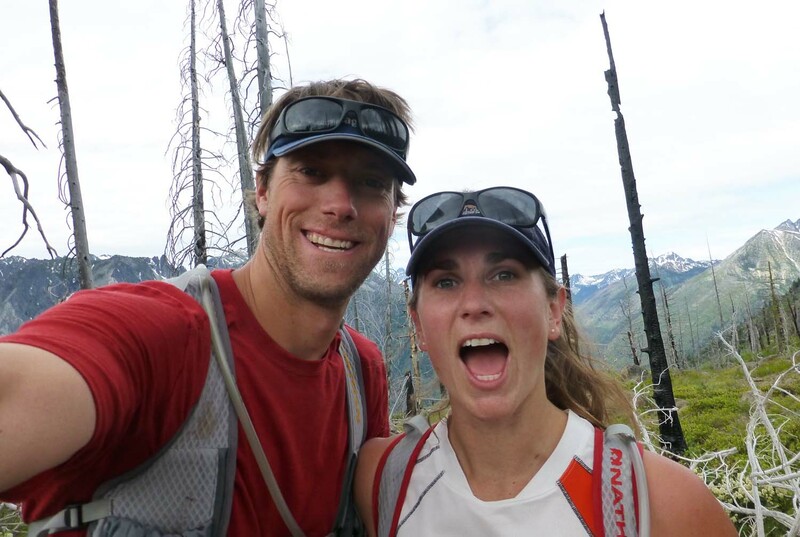 Icicle Ridge was put on my trail-running bucket list shortly after arriving in Wenatchee three months ago. 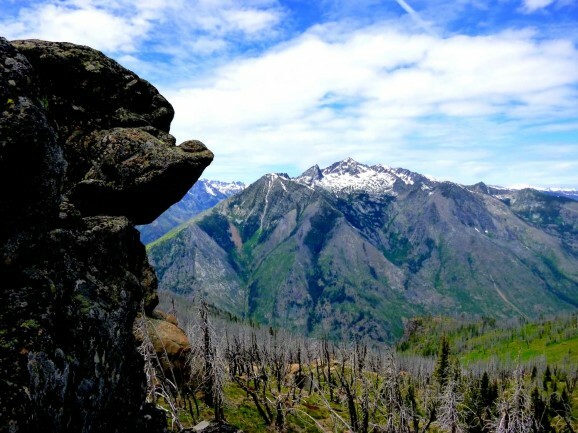 Depending on where you want to end, the trail climbs 5,000 to 7,000 feet and continues anywhere from eight to 30 miles. 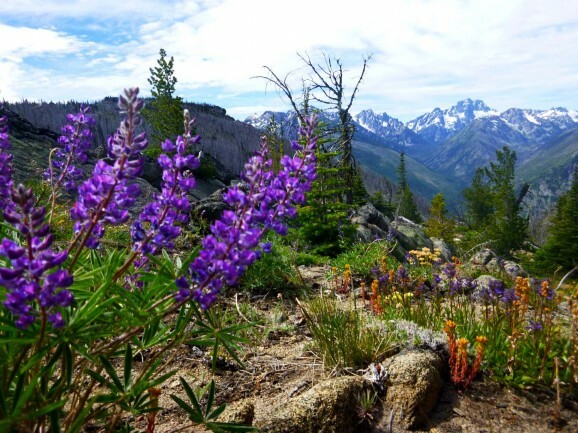 It offers expansive views of the Enchantments, Wenatchee Valley, Quincy and the surrounding canyons. As you can imagine, I was fixated on completing at least a portion of this epic run. 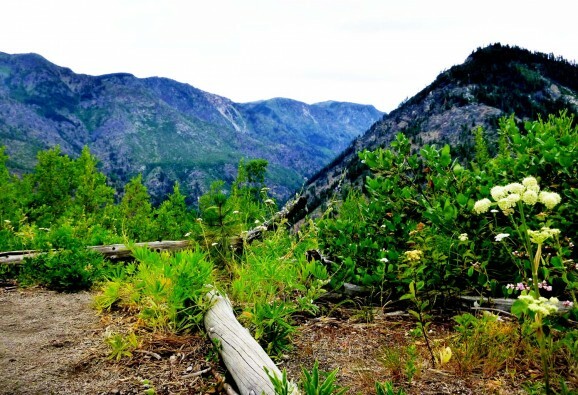 Outstanding views of the Wenatchee Valley and Quincy area were found at the top. Being that it was the Fourth of July weekend, my partner in life and running, Jared Vilhauer, thought it would be fitting to run/hike the Icicle Ridge loop down the Fourth of July trail. This starts at the Icicle Ridge Trailhead near the mouth of Icicle Creek Road. As you come down the Fourth of July trail, it spits you out — nine miles up canyon. The only way to get back to your original start is to either shuttle vehicles, hitchhike or plant a few bikes on the other end. We decided to make this a multisport adventure and opted to bike the eight miles back to the beginning trailhead at the end of our run. This would make the whole loop approximately a 21-mile multisport round trip. Testing out the Saucony Peregrine 4 on the trail. Getting up at 5:30 a.m., we crammed some peanut butter toast into our faces, filled up our water bottles and headed out from Wenatchee. Picking up bikes along the way from a friend in Leavenworth, we drove down Icicle Road at 9ish miles and planted them at the Fourth of July Trailhead. This is where we would end our end. 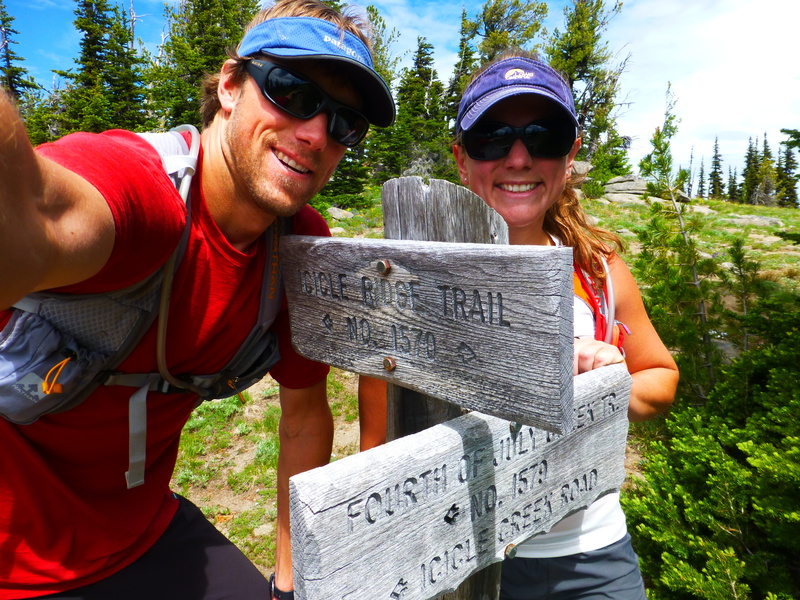 Hopping back in the car, we raced to the Icicle Ridge Trailhead, excited to start the day’s mission. The original plan was to get up and come down before it got too hot. 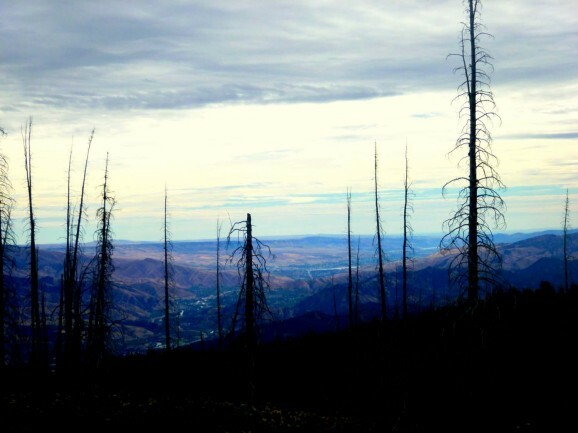 The ridge mesa up top was reportedly sparse and a hot place to be on a summer day. Given that temperatures were supposed get into the 90s, we had hoped to get up and down in just a couple of hours to miss the mid-day heat. Luckily, when we got to Leavenworth, it revealed overcast skies and hope for a cool day. Awesome!!!!! Trending uphill for the initial switchbacks. Heading up the trail, we both ran the trending uphill switchbacks for a couple of miles. Jared is a graceful uphill runner that paces himself and just chugs along. Growing up in the mountains and being a mountain guide, his legs are primed for this sort of work-out. I, on the other hand, struggle deeply and just try to keep up. 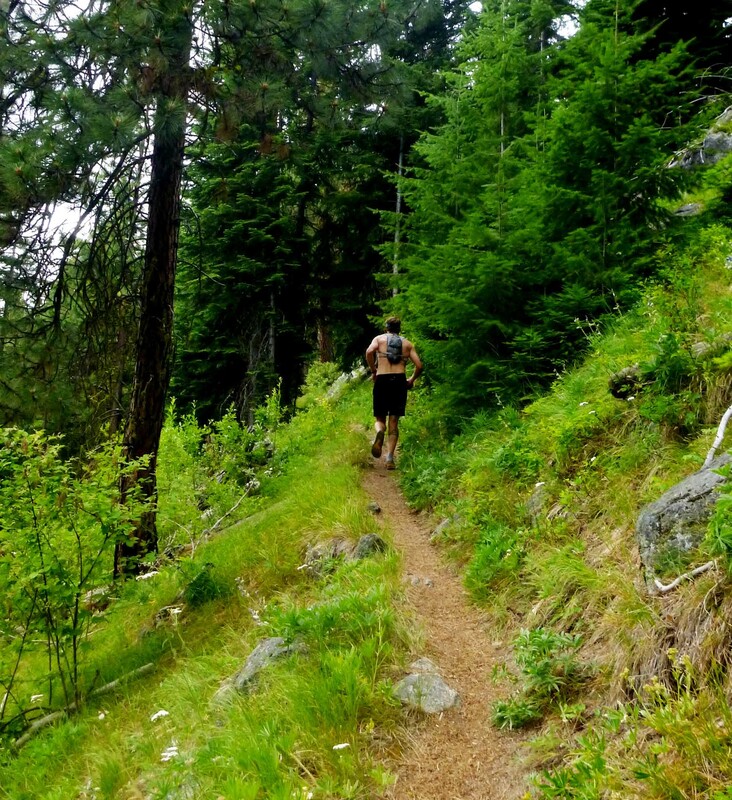 My technique is to run a switch back then walk one — especially when the trail gets steep. So that’s what I did. Surmounting the first knoll, we got our first sights of Tumwater Canyon and a look out onto the Wenatchee Valley. Here is a convenient bench made from an old tree trunk where you can take the opportunity to take everything in, reflect on your process and enjoy the day. As you can see, we did just that! Jared running up through the wildflowers. Heading up further through the Ponderosa pines, we hit a section of the trail called Steep Creek. As the name implies, this is where the rocky, pine-laden trail climbs up and up and up to the gorgeous mesas above. Up and up … we passed old burn sites with lush new undergrowth, crossed streams (valuable water sources! 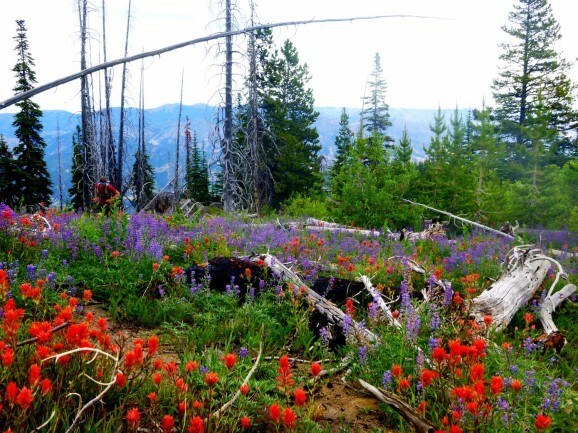 ), jumped over boulders, scoured small scree fields and even stopped to smell the flowers. We were intoxicated with the sounds of calm around us. We didn’t see anybody and this back-country wilderness was really calling out to our inner exploratory spirits. 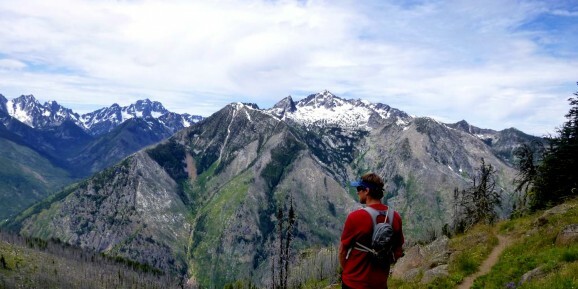 Jared enjoying the flats with views of the Enchantments in the background. Feeling tired after almost 5,000 feet of climbing. Finally, we gained the mesa ridge where we were introduced to flat and rolling terrain that headed upwards towards the 6,000-foot summit. Climbing from 1,500 feet, we were feeling a little tired and took a small break to fuel up. Looking around at a job well down, we were elated with happiness and the feeling of accomplishment. Views of the Enchantments and the granite rock of the area. 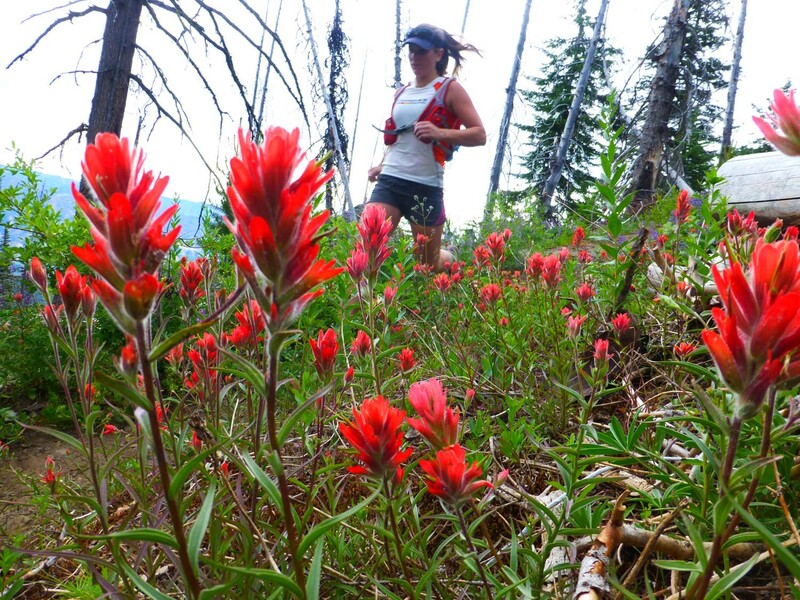 Running through the Indian Paintbrush of the mesa. Gaining the mesa — we just ran. As the trail angled down, it opened up beautiful meadows full of Indian paint brush, lupine, bluebells and whole variety of flowers that I can’t even name. Yellow, red, purple, blue, white, orange, green — colors that danced and swirled as our legs carried us over the alpine tundra. Taking a million pictures along the way, we hiked and ran intermittently while really enjoying the beauty of the area. Jared enjoying the beauty of the area. 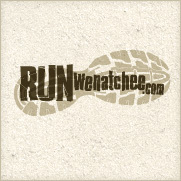 The most amazing thing about this run is how you can really see everything surrounding Wenatchee and Leavenworth. 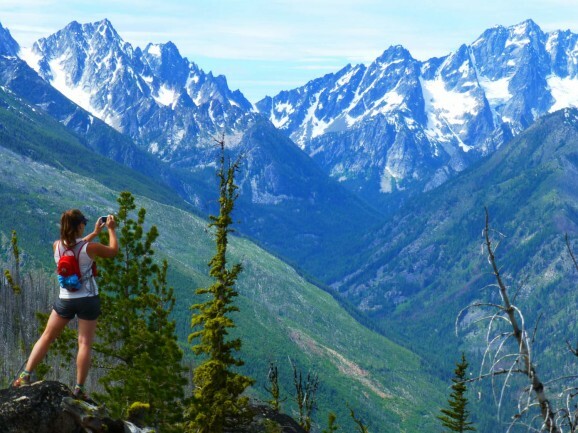 You can see all the way out to Quincy, all of the Enchantments and even the North Cascades. It’s just gorgeous! Needless to say, our mission that was supposed to be a couple of hours turned into a whole day affair. Once we reached the Fourth of July Creek junction, we started to see a few more people. Those celebrating the weekend with a hike up that trail. We descended about 4,000 feet down Fourth of July through several switchbacks on a sunny mountain slope. As a side note, make sure you bring some longer pants if you’re just hiking this section. 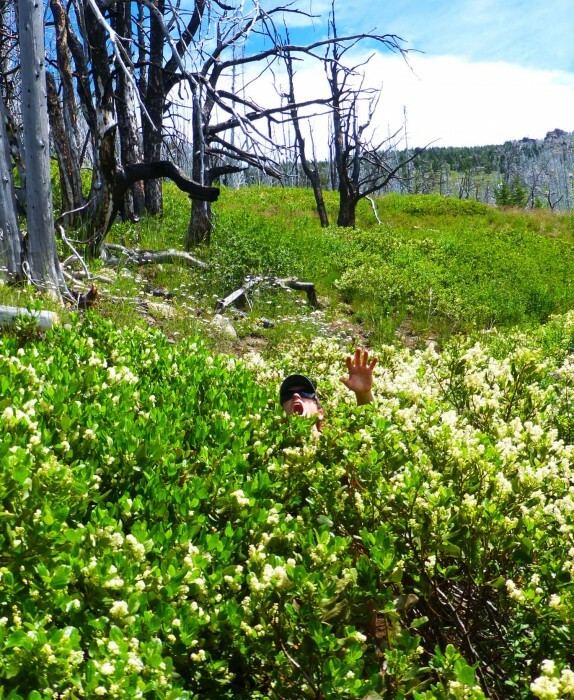 The bushwhacking along the trail gets a little gnarly! Jared pedaling 8 miles back to the car. I — once again — rolled my ankle half-way down and hobbled for about 3 miles back to the Fourth of July Trailhead where I was very happy to see my bike. 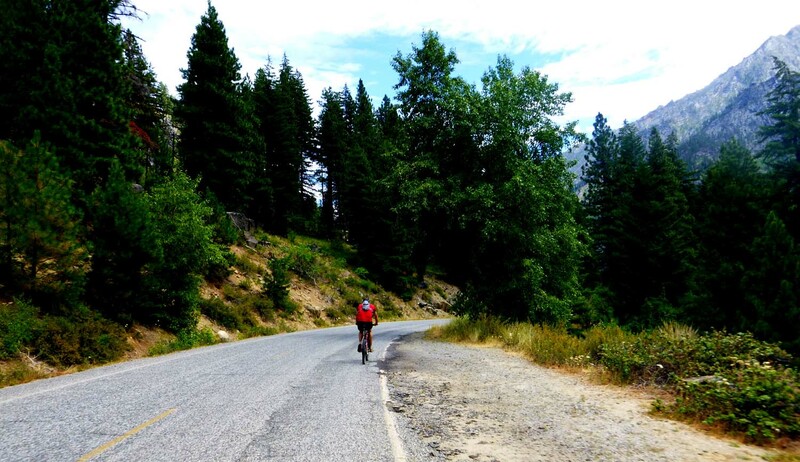 After taking a little time to stretch and reflect on our day’s mission and accomplishments, we pedaled the eight miles back to the original trailhead to finish the 21-mile loop. Overall, an amazing day on an outstanding trail in the Leavenworth area. 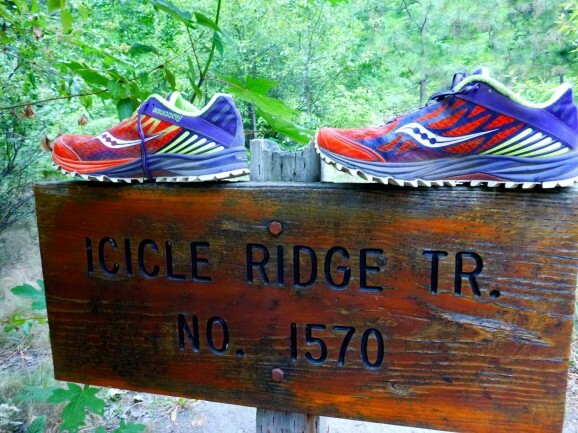 I would recommend this for hikers and runners alike. Try to do this on a cool day as it is a very exposed run and it does get hot! As a trail run, it is not for the faint of heart. 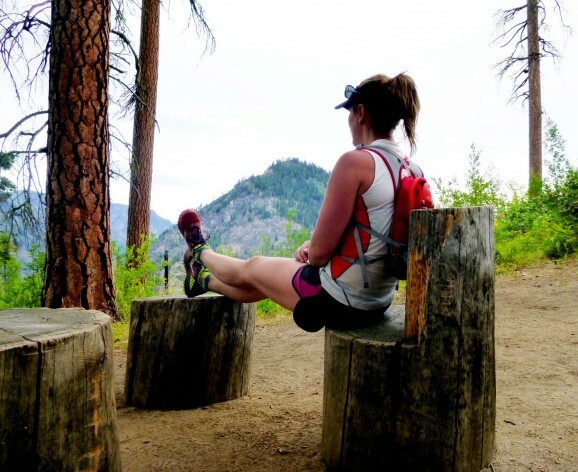 I would recommend it as a training run for the iconic local test piece called the ‘Enchantment Loop.’ It is a fantastic uphill trainer and offers runners and hikers alike the opportunity to test their stamina, endurance and strength. Most runners I know would hike/run this like Jared and I. 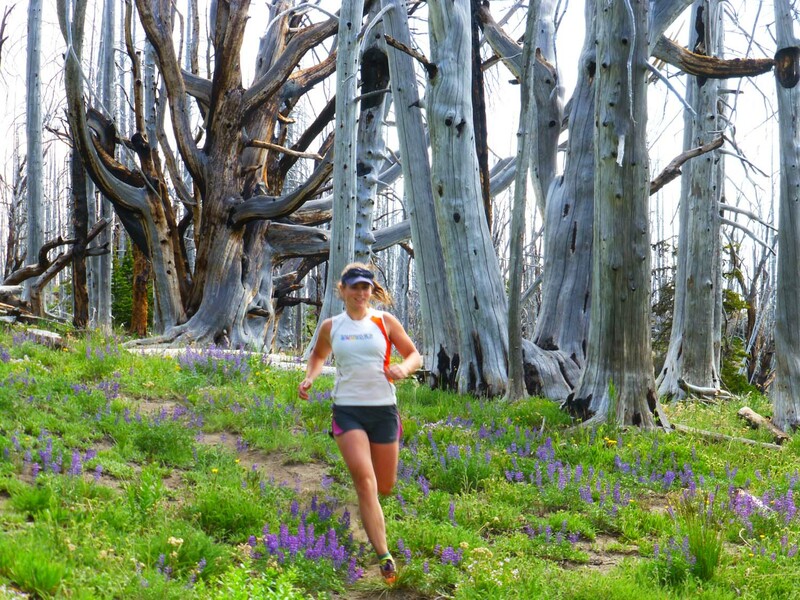 However, if you are an elite runner looking for a serious workout, this could be for you. Now that you’ve been informed of what’s in your backyard — get it! 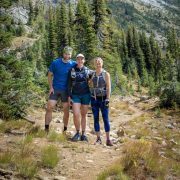 Take the time, go for run, go for a hike and get to those summits and views that will leave you elated with gratitude and happiness in our beautiful back country. 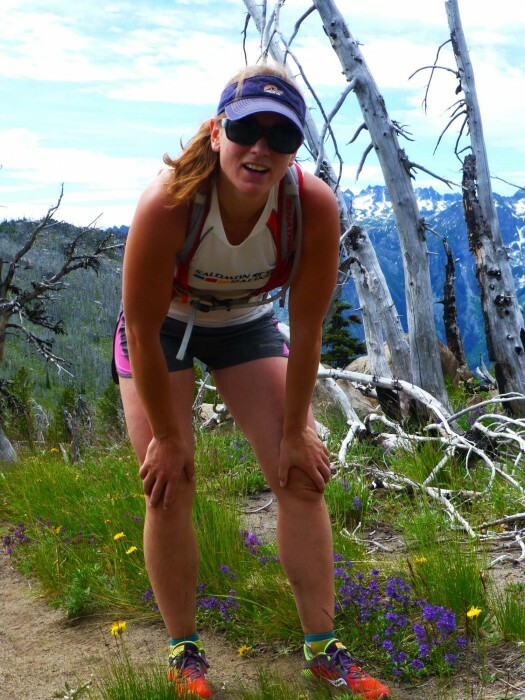 Cons: Uphill most of the way, also is hot during the summer so bring a lot of water. Enjoy the day — challenge yourself and get out!